I thought it appropriate to post this project today. Though it is not fully recycled it still has a bit of re-purposing, so that is good for earth day, right? Without further adieu, let me introduce to my little earth day Daisy. She is quiet (I am too lazy to add a mouth) and she likes to spend her time hanging out on my knitting bag. – Jezze – She is highlyskilled at making delicate adornments from pins (go buy some from her shop, they are worth it). – finally, the Sampler. Why the sampler? After just a few subscriptions to the sampler I have ended up with many pins that I don’t want to wear, and don’t want to throw away. Okay, now I can continue. There are a few pictures here in this post, but there are more in my Flickr set. Round 1: Sc 6 using the magic loop method. 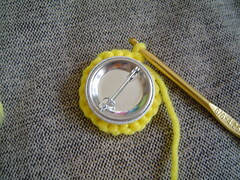 Slip the first stitch to form a circle. Pull the magic loop tight. Round 2: Sc 2 into each sc from round 1. Repeat all the way around. (Note: I only go through half of the stitch because I like the spiral pattern that it creates). Round 3: *Sc 2 sc 2 sc 1* all the way around. At this point my circle was just slightly bigger than my button, so I stopped. You might want to add one more round if yours doesn’t look bigger than the button. OPTIONAL Round 4: *sc2 sc1* all the way around. 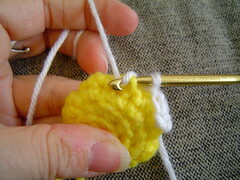 Now, to get the crochet to stay on the pin, we will decrease so it pulls tight around the pin. You are done with the center color. Fasten it securely and cut it leaving a long tail. At this point, you button might still slip out of its newly made cover. This is okay. We will tighten it up later. You can take this time to add eyes easily, or make trouble for yourself by doing it later (which is what I do). Did you see that? Just thought I would give you fair warning since I always miss important little instructions like that. 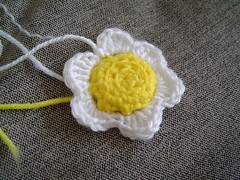 The petals are attached by crocheting a chain around the center that is secured at several points. Each petal is then worked in the gap between the chain and the center. 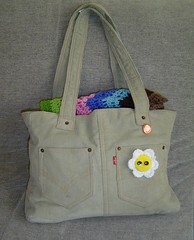 Attach the new color by slipping it together with one of the decrease stitches. Chain 3 and then slip one together with another of the decrease stitches, pulling the chain taut. You need to keep the chain as close to the center as possible, otherwise you will end up with a gap between your petals and the center. Now is the time to evaluate how many of these segments you think will go all the way around the center, as this determines the number of petals your flower will have. Too many? Then chain an extra stitch before attaching it to the decrease stitches. Now your chain is set up and you can make the petals. Into each space between the chain and the center: sc1, dc2, tr1, dc2, sc1. Almost Done… Did you add eyes yet? this is your last chance. Add eyes if you haven’t done so already. Weave in the ends EXCEPT for the long end you left on the center color. now we will take the final steps to secure the flower to the pin. I chose to go au naturale and secure mine without the aid of glue. 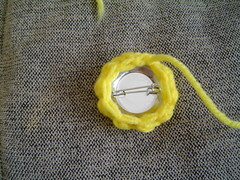 But a dollop of craft glue on the front of the pin would help keep the flower in place, and also help secure the ends. so go for it if you want. 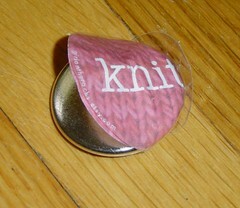 Make sure that before the glue is dry you rotate the button so the actual pin is horizontal. As the last step, we will take the long end and use it to cinch up the back of the flower, pulling it snugly against the pin. Thread the long end on a tapestry needle and run it behind three opposing decrease stitches. make sure not to obscure the pin. pull tight and secure. Viola! Done! **Stay tuned for a tutorial on how to make your own eyes. 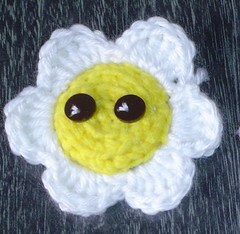 4 Responses to "Earth Day Daisy"
Thanks for the mention! I love your pin, and the tutorial you’ve put together is great. Very Cleverly and uniquely done! Thanks for sharing. I LOVE this idea! I have a pile of messed up junk mail buttons myself that I can’t bear to toss out…plus a grandmother with the middle name “Daisy” (who of course loves dasies), who is having a birthday next week! Thanks for the sweet idea!